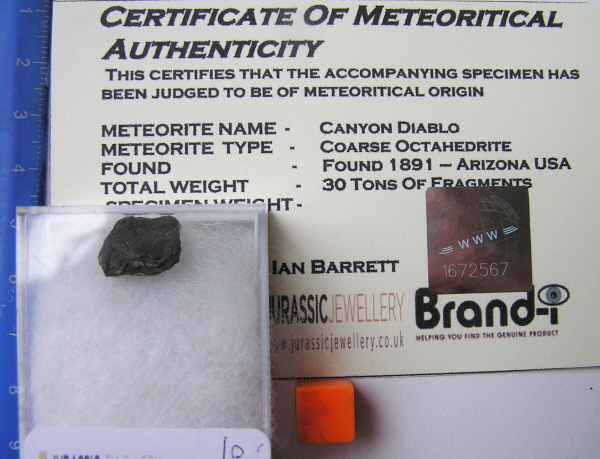 << Back BOXED CANYON DIABLO METEORITE - RARE AND INTRIGUING! - Last Few Left. BOXED CANYON DIABLO METEORITE - RARE AND INTRIGUING! - Last Few Left. This is a superb boxed Canyon Diablo meteorite. Meteor Crater in Arizona USA is the biggest meteorite crater on Earth and this is a super little relic of this legendary impact site. Collecting on the site has long been banned so this is a good opportunity to obtain your own specimen. and is nicely labelled and boxed in a protective padded plastic box. You will also receive a signed certificate of authenticity and an exclusive free gift , an illustrated A4 meteorite information sheet. This was written by Mark Ford - Secretary of the BIMS (British And Irish Meteorite Society) and gives a useful overview of meteorites. It will offer no revelations to a dedicated meteorite buff, but will be indispensable for a complete novice.